Ben Robinson|GoBuccs.com Miami East’s Ian Gengler fends off Covington’s Parker Dysinger Friday night. Ben Robinson|GoBuccs.com Covington football coach Ty Cates gets the ice bucket after the Buccs big win over Miami East Friday night. COVINGTON — If anyone wonders what type of kids the Covington and Miami East communities have, all they had to do was witness the final 50 seconds of an epic rivalry battle Friday night. After a brutally physical, back-and-forth battle where Covington had basically sealed the contest with an interception by Andrew Cates, the Buccaneers took a knee with 54 seconds left. With one final snap still needed to be executed, players on both teams hugged each other in mutual respect and congratulations for a hard-fought battle. The officials had to separate the kids on each team so the final snap and knee could take place. Two programs who have played some doozies over the years, many of which Miami East coach Max Current has been involved in as a player and a coach. There’s the 1965 game where Miami East shocked Covington 12-6 as Lester Tasker scored the game-winning touchdown with 52 seconds left to end the Buccs’ perfect season. There’s the 1980 season where the two teams played to a 7-7 tie in the final week of the regular season before Covington went on to the State Semifinals. There was the 1985 slugfest where Covington held on for a 19-14 win over a Viking team that entered the game as heavy underdogs. The 2008 contest where Miami East defeated Covington for the first time in 11 years on their way to the first of three CCC titles since joining the league in 2006. Then there was the 2010 marathon that went into overtime before Covington won 40-34 on a 20-yard run by Jake Stewart in a contest that ultimately decided the league title. More recently, the 2015 overtime affair where Covington blocked a Viking extra point in overtime to escape with a 21-20 win and force a share of the CCC title between the two teams. And this one ranks up there with the best of them as the outcome was in doubt until Andrew Cates picked off a Viking pass and returned it to the Miami East 21 with 54 seconds left. For Covington, a team that opened the season with three tough losses, the 19-17 win was as sweet as any victory the Buccaneers have had in years. Max Current isn’t one who ever doubted how good Covington is. The reality is – both Miami East and Covington are good football teams who are well coached. Which made for an epic battle that was scoreless after one quarter of play and didn’t see any points until a freakish play with 1:46 left in the half. That’s when Covington lineman Jesse Fisher scooped up a fumble by teammate Duncan Cooper and ran it in from three yards out for a 6-0 lead as the point-after attempt failed. But Miami East has a potent offense that can break a game open at any time. And despite being held in check over the majority of the first half, the Vikings did just that as quarterback Ian Gengler connected twice with Justin Brown to move the ball to the Buccaneer five. Vincent Villella did the rest by powering his way in a couple of plays later to give Miami East a 7-6 lead as the extra point attempt by Wes Sutherly flew down the middle of the uprights with 16 seconds left in the half. Covington then gave Miami East a gift as it fumbled on the first play of the ensuing possession, which allowed the Vikings to attempt a long filed goal with 0.4 seconds left on the clock. Fortunately for Covington, the field goal was short as the two teams went into the locker room with the Vikings holding a slim 7-6 lead. Miami East had three opportunities in the red zone in the third quarter, but was only able to turn the chances into three points on a 25-yard field goal by Sutherly on the final play of the quarter. The other two red zone threats ended in a missed field goal and a turnover on downs thanks to a huge sack by Covington’s Parker Dysinger. 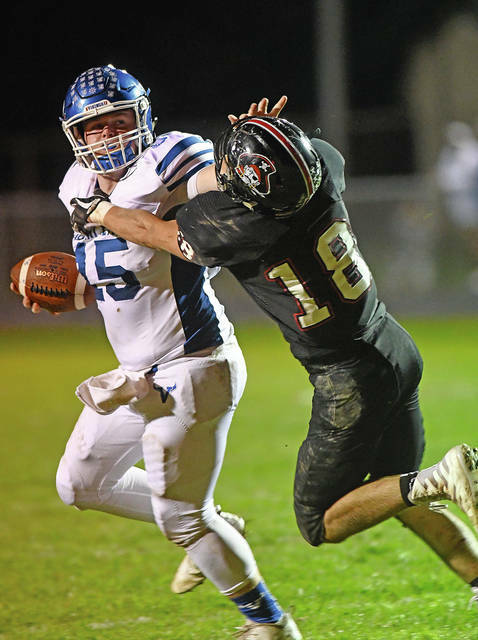 Missed opportunities in the red zone would ultimately come back to bite Miami East as Covington managed to get its ground game going. First, behind a 12-play 61-yard drive, the Buccaneers took a 13-10 lead on a 10-yard run by sophomore Duncan Cooper and the extra point kick by Brayden Wiggins. But Miami East struck quickly as Gengler connected with Brown for 52 yards to the Buccaneer one on the first play of the ensuing possession and then Brown finished off the 15-second drive with a one-yard run to give the Vikings the lead right back at 17-13 with 6:31 left in the game. Covington, who originally hoped to use the passing game to get the ball into the hands of its skill players in space, elected to go to the ground-and-pound approach in hopes of a comeback win. And the strategy worked to perfection after Duncan Cooper returned the ensuing kickoff to the Buccaneer 49. Methodically Covington moved the ball down the field with the power running game behind linemen Ian Wilson, Grant Babylon, Gavin McReynolds, Eli Gerling and Jesse Fisher. It took 4:16, but Covington was able to move the ball to the 14 and then hit pay dirt on a fourth-and-four pass attempt from Cade Schmelzer to Andrew Cates. The kick for the extra point was blocked, which made the score 19-17 in favor of the home Buccaneers with 2:15 left on the clock. And 2:15 can seem like eternity with a potent offense like Miami East, but fortunately Covington has a player who has a knack for making big defensive plays at the right time. And that player is senior Parker Dysinger, who recorded a huge quarterback sack on second down to move the Vikings back to a third-and-21 situation. Then, on the very next play, Dysinger got into the face of the Viking quarterback to force an underthrown ball that was intercepted by Cates to virtually end matters with 54 seconds left on the clock. After a pair of knees, the Buccaneers celebrated by giving Coach Cates an ice bucket bath on the sideline before heading to the locker room to share in the moment as a team. And it took an epic battle against a very talented Miami East team to show that growth. https://www.dailycall.com/wp-content/uploads/sites/30/2018/09/web1_ian-gengler.jpgBen Robinson|GoBuccs.com Miami East’s Ian Gengler fends off Covington’s Parker Dysinger Friday night. 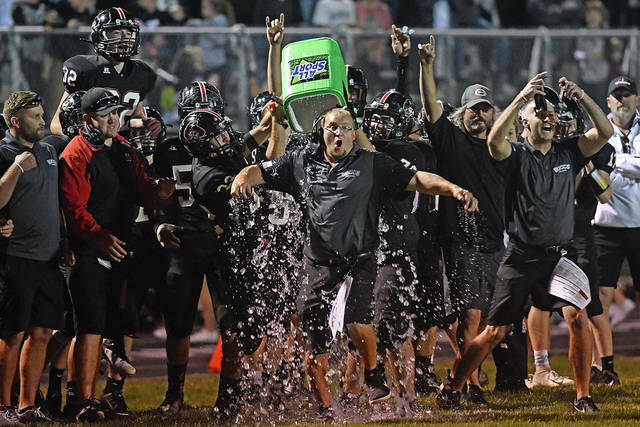 https://www.dailycall.com/wp-content/uploads/sites/30/2018/09/web1_coach-cates.jpgBen Robinson|GoBuccs.com Covington football coach Ty Cates gets the ice bucket after the Buccs big win over Miami East Friday night.